We have to give credit where credit is due. The chefs who came back for this All-Star season of Top Chef have given us lots of reasons to root for them. And the quality of this season has done a lot to wash the bad taste of Season 7 (filmed here in Washington) out of fans’ mouths. By the end of tonight’s episode, we’ll be down to four remaining chefs. And if bringing an extra chef along to the finale in the Bahamas means we get one additional week of sunny skies and killer cooking, we’re all for that. Yesterday, we shared our interview with Mike Isabella as we head into the finals. 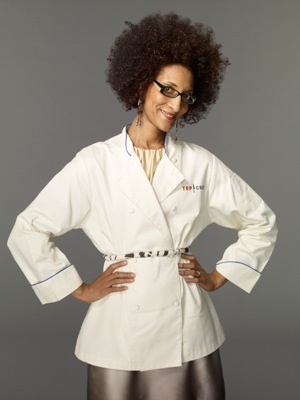 Today, we’ve got our pick for fan favorite, Carla Hall. There’s something about the way Carla seems to root for everyone to succeed that is endearing and rare on competition shows like Top Chef. Watching her fall short of her own expectations – especially when working with “her flavors” and cuisines – is heartbreaking. But we’re not telling you anything you haven’t already seen for yourself. Capital Spice: You’ve really come out swinging this season! Three Elimination Challenge wins, three big prizes. How does it feel so far? Carla Hall: It’s great, but I really don’t know when Matthew [her husband] and I are going to get a chance to take all those trips. CS: Beyond the trips, you seemed really excited to win Jimmy Fallon’s challenge. Are you that big a fan of his? CH: There were two things going on there. I’m definitely a fan of Jimmy’s, and it was so much fun to be on his show. He really is just like you’d expect him to be. But I’ve got a personal connection to chicken pot pie as well: that’s the first thing I ever tried to cook for myself back when I was modeling and going back and forth to Paris. CS: So this was a recipe you’ve made before? CH: It was, though I’ve never tried to make the upper crust by forming them around cookware like I did. I’m glad it worked out! More of Carla’s projects in the works after the jump. CS: Throughout the season, you’ve talked about wanting to cook “your food” and to show the judges who you are. Do you feel like you’ve been able to do that? CH: I do. I’ve done the food I want to do. 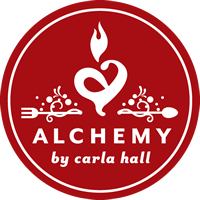 I’m working to inspire home cooks to get back in the kitchen, to make cooking fun again. And I didn’t want to compromise that just to win – if my food can’t win, why would they have invited me back? CS: We read last week that you’ve joined the board of DC Central Kitchen, a great organization that we’re big fans of. Congratulations! CH: Thanks! Really, this was a long time coming. I’ve been involved with them for years, but I have so much respect for their programs that I wanted to make sure that I was able to dedicate the time they deserve. I didn’t want to disappoint them. CS: Are you working with any other groups like DCCK? CH: I also serve on the board of [Chef Art Smith’s] Common Threads. CS: You’ve been busy lately – what’s this we hear about you being named Washington, DC’s “Secretary of Love and Relationships” for 2011? CH: Laughs. I lucked into that one, but I’m pretty sure it had nothing to do with my predecessor [Dr. Ruth Westheimer]. I’ve been doing a lot of work on the branding of Cooking with Love, so it seemed like a good fit when they asked. I hate to say it, but Matthew and I still haven’t had a chance to go on our date! CS: And you’re working on a cookbook? CH: I am! I’m working with Genevieve Ko, but it’s a lot more homework than I expected. Genevieve and I hit it off right away – she gets me and can write in my voice. CS: No wonder you put the catering business on hold! How are things going with your Alchemy cookie collection? CH: They’re going great. We got a big bump from the Wall Street Journal shout-out last month, and the folks at Destination DC have been very supportive. They give them out as gifts. CS: Sounds like they’re a hit. CH: Feedback has been really good so far. I tell people the cookies are “Made for Sharing” size – sharing makes people happy! But some people insist that they’re actually “Made for Eating the Whole Thing Myself” sized. CS: Do you keep up with many of your fellow contestants? CH: I do! I met a lot of memorable, wonderful people through Top Chef. I just had dinner with Tiffany [Derry, fellow all-star final fiver and season 7 alum] at the Oval Room where Tamesha [Warren, also from season 7] is the sous chef. The food was delicious, with yummy-yummy crabcakes and Indian-spiced sugar pumpkins. I loved their sweetbreads! I also keep up with Antonia [Lofaso, also in the final five] and Ariane [Duarte, who was on season 5 with Carla]. I’ll be seeing Jeff McInnis in Charleston this weekend, and of course I love Spike [Mendelsohn, season 4] and Mike [Isabella, another final fiver] from DC. After seeing him in the Ellis Island challenge I really became a fan of Mike. CS: Who among your fellow all-stars do you think went home before their time? CH: Most of them! The thing is, we’re all really good chefs. The slightest thing could send you home this time. We were floored that Jennifer Carroll went home so soon, and Tiffani Faison too. I was really upset about Dale Talde going home, not because I wanted someone else to go home in his place but because he was really doing well, both personally and in the competition. I would have loved to have Dale with us at Ellis Island. CS: Well thanks for taking the time to chat with us again, Carla. We can’t wait to watch you in the Bahamas! Who do you think will make it to the finale this season? Let us know in the comments section – we want to know who you think will be the last three standing! What a great interview! I’m really pulling for Carla. I am a huge fan! SPOILER ALERT!!! To protect those who haven’t seen this week’s episode yet, we’ve whited out the text in this comment. Highlight it if you’d like to read it.